That morning, as the sun shone brightly behind beautiful clouds and cold winds blew as if it could make me forgot my problems in an instant. The atmosphere made me remember the story a few years ago, about a story my friend had. The story of someone who turned out to be her best friend she missed the most. A simple stories that she remembers. It all started when he and I were in a house and I listened to all the problems he was going through. I still remember when he first invited me to go to a place he kept secret, the place that said could bring me peaceful and happiness. At that time he had a problem that I did not know clearly and I also had a problem too, but my problems mostly was only with my homework. He took me to an area like a hill, towards the tree house he said. At that time I was thinking of a house in a tree, just like the one in the ‘Heart’ series that I often watched when I was kid, but the reality turned out to be different from my expectations. What I saw was a wooden house that looked like a house on stilts, complete with a wooden stairs. It turns out he called it a tree house because of the height and its location around the trees. We just sat in the wooden stairs’ house. He said that if we wanted to enter the house, we had to have told the area guards there and had to pay. Because at that time our pocket money not much and was used up on snacks during the school breaks, so we just sat on the stairs. At that time, we just kept quiet for a long time. I remember when I was in silent, my mind was thinking about why this tree house was so different from my mind and I still did not want to accept that fact. But the longer I thought about it, the more I looked at the scenery in front of me and realized that the scenery there was beautiful. The trees blown by the wind seemed to dance beautifully, the chirping of birds that made me felt peaceful, and the cool blue sky was seen. It could be seen also a group of people who made hammocks among the trees on the other end, they were seen enjoying the gathering time, was joking with each other, was humming with the strains of the guitar, and some were sleeping. In another corner, I saw a clear river, and it looked even more beautiful when the sunlight penetrated the leaves and produced light in the water. My gaze returned to my friend that was beside me and then he left to sit by the window of the house. At that time we were pretty familiar in class, because he often borrowed my stationeries. In that moment what I remember he was suddenly telling me his problems. Problems about homework that never ended -because he did not do it-, problems with his friends, and problems about himself. One of them was about his friendship; and that time I just found out that he was not happy to be in the environment of his friends. He said that he felt exilated, he felt unappreciated, especially when he was bullied by his friend. Apparently he felt depressed when was together with his environment, even though it was a new environment, and that was why he invited me to this place. At that time I never thought it had ever been in experienced by him. During this time I saw him as someone who was in a happy environment because he was seen always with his friends and gathering as if there was nothing wrong he was experiencing. After he told the problems, he immediately suggested me to leave the tree house because it was getting dark. Since then, we become a close friend. 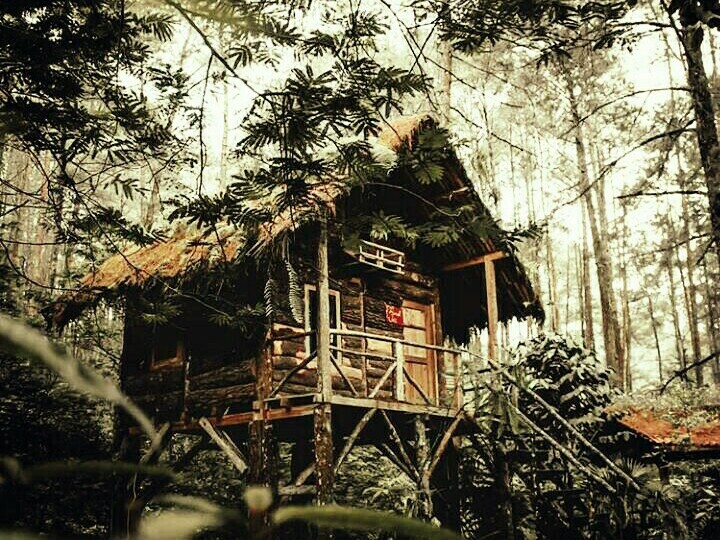 Every time he invited me back to the tree house, he told me again about his problem the time I only listened to him without giving a solution because at that time I did not really understand all the problems he was going through. Since then too, it seemed that my views on people had begun to differ. The problems he told me often made me paid attention to other people, about how they behaved, their expressions while talking, and the behaviour they pointed out. My views on my friends were different, because I began to realize that there were some of them who acted like they seemed to care but the truth was not like that. The tree house seemed to be our place to tell about problems, not frequently I also shared my little problems, most of which were about my pets. Although the story that I have just looked like a joke that I made to cheer him up, but I also became happy because I could entertain him. I did not knew what will happen if I was in his position with all problems that happened to him. The told stories’ routine also seemed to be a weekly activities that I was always waiting for. Telling stories on the stairs’ house -until then I was no longer curious about inside of the house because I had peeked through a wooden hole, and there was nothing- after school and came home when the sky was getting dark. At that time I also often waited for the sky to turn orange, and the sunlight penetrated through the leaves that began to fall out, and the wind that was always cool without pollution. From then on, not frequently we at school became more often in telling stories together, and became often doing homework together in the tree house. But a few months after that closeness, I became unfamiliar with him. Due to our class now was different, and because my best friend liked him. I did not knew when exactly my best friend started to like him, which clearly I knew because I started to pay attention to my closest friends more often. From that moment on I began to keep distance from him. At that time what I was thinking that I did not want my friendship to disappear because my best friend liked the boy who was my new best friend. But that made me realize that I did not pay attention to him because I thought he could get past everything just fine by himself. Several times he invited me to told stories at the tree house, but often I refused with reasons that were not reasonable -like I was suddenly sleepy-. At the same time, when he began to accept about my attitude that kept distance from him, I began to feel that I was missing one of the routines that I always waited for. When I began to feel bored, started to feel tired of the activities, I returned to remember the tree house which is now beautiful in my memory. It felt like I miss hearing the birds chirping that feels nice there, even though there was the sound of birds chirping near the school, but it felt very different. Maybe one of them, I missed the stories he had. My relationship with him was no longer close although that was my desire. But I felt a little sorry, I, who at that time could not came to the tree house again because the distance was quite far on the hill and there were no public vehicles that passed that place, especially I was too afraid to come alone. If I met him, we just say hello or even asked about teacher. It felt difficult to get back to be close again as once it was, and now those memories were just the simple memories that felt beautiful for me, and I felt like I can still felt the atmosphere when I was in the tree house like the first time I came. The atmosphere that felt difficult to be repeated again, especially the atmosphere of the stories that I still missed sometimes.